This worksheet will give you an approximation of your Social Security income. For an exact number see the Social Security website. 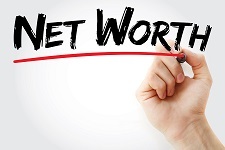 Your Net Worth is the total of all your assets minus the total of all your debts. This calculator helps you get a handle on where your stand. Included in your Net Worth should be your Social Security present value and the present value of any Defined Benefit Pensions you have. We provide inputs for both of these.